Sutton Masque is a Morris dancing side from Sutton-in-the-Isle in the southern reaches of the Cambridgeshire fens. We were founded in 2014 because Bob wanted there to be a local Morris side. 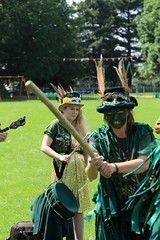 We are a mixed side, (both male and female members). If you are interested in us dancing for you, please just send us your request. No event is too large or too small! We thoroughly enjoy our dancing, so our rates are very reasonable helping to cover the costs involved in allowing us to continue. 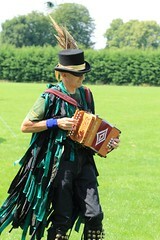 We also welcome new members at any time whether you wish to dance, or to play the music that we dance to. We practice on a Wednesday evening. 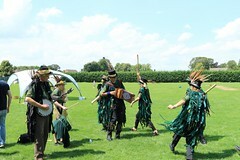 In the summer you’ll find us dancing out at one of a number of pubs local to Cambridgeshire and sometimes beyond and in the winter at the Village Hall in Witcham. Exact times tend to be flexible depending on light and rain, so if you would like to join in, it would be best to contact us first to get up to date information. The side was founded by residents of Sutton but we are now expanding and have members from much further afield, so, anyone local enough make a reasonable number of practice sessions and commit to some of the dance outs will be very welcome. You can contact us by emailing our squire.